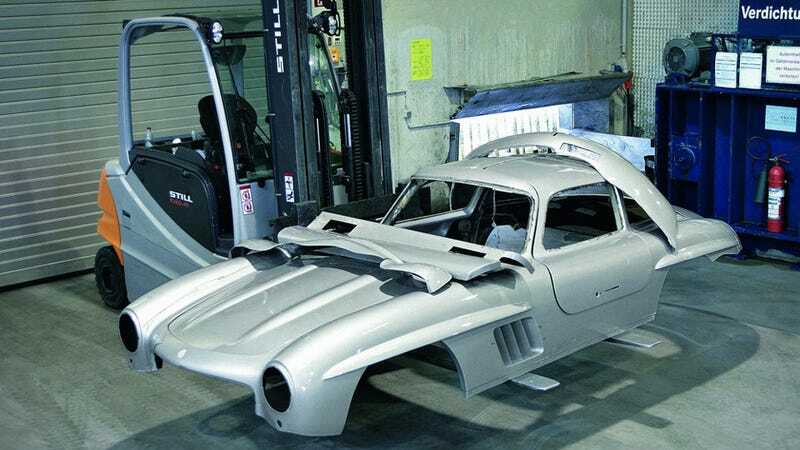 As an ominous warning to counterfeit 300SL builders the world over, Mercedes-Benz released pictures and a press release this past week showing the company dismantling and destroying a 300SL replica that was seized by customs officials. Although the fiberglass body did not feature any official trademarks of Mercedes-Benz or Daimler AG the body design of the 300SL is protected under copyright law as "a work of applied art". With this in mind, the company was snapping pictures when they decided to teach the illegitimate replica car world a lesson. "The certified equipment used in the centre includes two presses, each applying over 30 tons of pressure. The replica sports car had a fiberglass body weighing precisely 148 kilograms, which the compressor smashed into small pieces. This dramatic end to the unlawful body was officially documented with a signed and stamped 'confirmation of scrappage'"
According to Mercedes they are currently figuring out how to spread their fake W198 search and destroy mission outside of the EU. While we understand the company's desire to protect their intellectual property, we're pretty confident the replicas haven't exactly had any negative effects on 300SL values. Hat tip to #1785935 - Mikeado!